If you want every year significantly to gain muscle mass, your diet should contain carbohydrates. But many of us get fat from just one word “carbohydrates.” What should do such people? 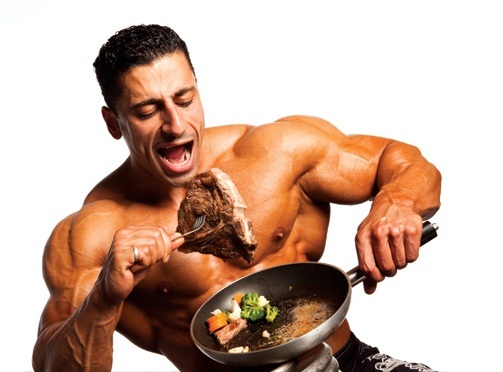 Never eat carbohydrates out of fear that they will get fat or leave bodybuilding? In this article Goldenmusles.com will focus on methods that will keep the accumulation of fat under control without sacrificing hypertrophy. During bulking cycle you need insulin production. This is a highly anabolic hormone, as well as extremely anti-catabolic. Combining these two features Goldenmusles.com guaranty you’ll get an amazing recipe for gaining muscles. The constant use of large quantities of carbohydrates for most people will lead to accumulation of fat. It’s amazing to take notice how every day scales shows weight increasing. But looking in the mirror in few months, do not be surprised if you find a reflection of a sumo wrestler. Next will be presented several ways of controlling the intake of carbohydrates in order to gain lean muscle mass. Try each of them to find the best approach for you. These approaches of nutrition suppose that you should be relatively thin (visible press and with the lack of excess fat on the lower back). If it is not your case, before using one of these methods, focus on losing weight. When you become slimmer, you can afford a very different ratio of nutrients in the diet, and your body will not be predisposed to the conversion of extra calories into fat. In our plans always intervenes genetics (eg, it matter if you have insulin resistance or not, dominate in your physique endomorphic features over ectomorph, etc. ), but in this case you will do better if you first lose weight. As in the case of the ketogenic diet, this method involves only the consumption of carbohydrates over training (before, during or after). At other times, they must be either zero or very small amount (carbohydrates from vegetables or nuts). This diet maintains stable insulin levels, except around the time of training. Start with a protein intake of 3 to 3.5 g, and from 1 to 1.5 grams of fats per kilogram of dry body weight (DW). Carbohydrate intake during exercise should be around at 2 g per kilogram of DW. Remember this is just the beginning. After a week or two of such a diet, you may find that you need to increase or decrease the amount of carbohydrates (or to increase or decrease the amount of proteins and fats) – and all this to get the desired result. As with any diet, this method has flexible frame, and everything to go in the right direction, you need to experiment, observe and, as necessary to correct something. This method is best suited to those who train in the afternoon or evening. It is similar to the method described above, but only involves the use of carbohydrates immediately after your workout, and the next few hours – usually right before bedtime. If you eat after a workout three times, then carbohydrates must be in each of the three meals. The starting amount of proteins, fats and carbohydrates will be the same as in the previous method, with the difference that carbohydrates should be consumed only during the post-workout meals (and not before or during). For example, if you normally consume 200g of carbohydrates throughout the day, you can beat that number by 3 post-workout meals to 65 grams of carbohydrates in each. This approach allows the use of fat as the main source of energy in the first half of the day and during your workout. With this approach, you consume proteins, fats and carbohydrates with almost every meal. An exception is the post-workout meal, from which you eliminate fat and the last meal from which you exclude carbohydrates. All other meals include all three kinds of nutrients, with an emphasis on protein and fat, the amount of carbohydrates – from low to moderate. It may seem somewhat counterintuitive at first glance, but combining all three nutrients, you get much slower digestion of carbohydrates and stable supply of energy, thereby maintaining control of insulin levels. Post-workout meal shouldn’t contain fat, because at that time you need a more rapid digestion of carbohydrates. But from the last meal are excluded carbohydrates because there is no need for the energy source at that time. Inputs of proteins, fats and carbohydrates for this method will be the same: 3-3.5 g protein, 1-1.5 and 1-1.5 g fat g carbohydrate per kilogram of DW. Again, it is possible to make changes to this method as needed by the addition or cuts of carbohydrates, depending on the individual needs and the reaction. Protein: eggs, lean beef, chicken breast, turkey breast, fish, high-quality protein powder, low fat cheese. Fats: Extra Virgin olive oil, macadamia nut oil, all-natural peanut butter, almond paste, fish oil, coconut oil, nuts. Carbohydrates: oatmeal, rice, potatoes, sweet potatoes, bread from sprouted grains, fruits. For post-workout meal is ideal fast-digesting carbohydrate powder. Using any of these methods, you may find in about week that you feel a easy exhaustion. Instead of increasing the amount of carbohydrates in the diet, introduce a reefed in your diet once a week. This can be a high carb day supply, or one high carb meal. Reefed is necessary to replenish glycogen and slightly speed up the metabolism. Some people use a “cheat meal” (meal during which you can eat any junk food) instead of “reefed”. “Cheat meal” serves the same purpose, as well as to satisfy the cravings for junk food. However, be careful with “reefeds.” If used improperly, they can become a direct route to the accumulation of fat. Use them wisely and take notice on the effects, will it be negative or positive on your body and your workout. BCAA – are used during training to maintain the anabolic and anti-catabolic processes in the body. Creatine – helps on building muscles and increase strength. Complexes of fatty acids – the building material for the synthesis of anabolic hormones! Gainer – used during workouts around to promote anabolism and anti-catabolism. Use carbohydrates in right way! Carbohydrates – is not bad, but it is a double edged sword. They can contribute generously to anabolism (muscle building) and anti-catabolism (preventing muscle breakdown), but they can also inhibit fat burning and increase fat stores. Use carbohydrates correctly and then you will restrict their disadvantages and only benefit from their advantages. What kind of cardio is more effective in losing weight?